Help prospects determine if an ARM is right for them. Sometimes ARMs make sense, sometimes they don't. 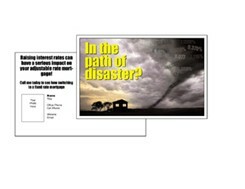 When the market dictates that it's time to move to fixed rate, alert your customers and prospects with this jumbo postcard. Full color both sides, 8.5"" x 5.5"" Customize It - Once you've placed your order, you'll upload or email your photo, logo, contact info and any designations you'd like to include. We'll send you a proof, normally within one business day. We don't print it until you say it's ready.